Swimming in debt can spark all sorts of thoughts and acts of desperation. In some cases, filing bankruptcy seems like the most viable option on the table. Bankruptcy? Aren’t there several types of bankruptcy? Well, if you’re like most, you know very little about the process, how to file or what the difference is between the bankruptcy types. The main types of bankruptcies or at least, the most common are Chapter 7 and Chapter 13 bankruptcies, which can significantly help in reducing or eliminating debt. If you’ve heard about a Chapter 11 bankruptcy, that is strictly for businesses. For individuals, the two programs mentioned above will be lightly touched on. So let’s see what the big fuss is all about and what the real difference is between Chapter 7 and 13 bankruptcies. This type of bankruptcy is called a liquidation bankruptcy and it’s the kind you hear people talk about when they say,” They took everything I had! This completely wiped me out.” Generally speaking, this is somewhat true, as you attest to the fact that you are unable to repay any portion of the debt. This type of bankruptcy is associated with individuals with low income or those who have few resources available to them to enable a repayment option. Instead, eligible assets as assigned to an agent otherwise known as a Trustee. This person will liquidate or sell any of the eligible items in order to pay back as much of your debt as possible. This means it is possible to have quite a bit taken away from you, especially if you have a handful or more of assets. 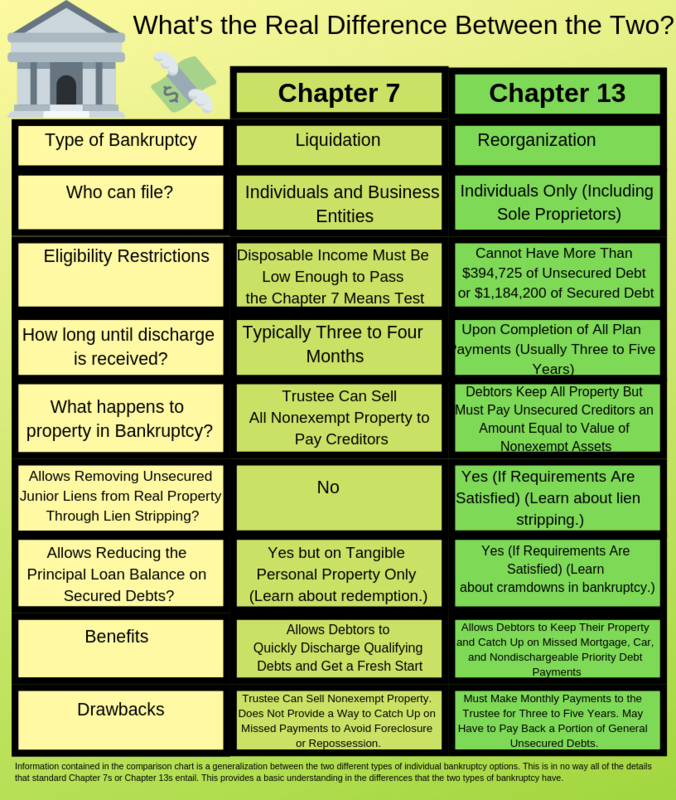 Chapter 7 bankruptcies are usually reserved for those who have limitations to their income and do not have the ability to repay any portion of their debts. Households whose incomes fall below the state median level are eligible for Chapter 7. Those who have low income but the income is above the median are required to pass a “means test” to determine if they have access to enough disposable income to repay the loan. If you are not eligible for this type of bankruptcy because of income requirements, then Chapter 13 may be more suitable. Where does my debt go when I file a Chapter 7? When Chapter 7 is filed and after the Trustee has liquidated all available assets, the court’s decision will wipe out existing debt, including credit and medical debt, which typically takes a few months. Chapter 13: Can we agree on something in the middle? If a Chapter 7 bankruptcy is out of the question, then it’s time to look at Chapter 13 as an alternative. This type of bankruptcy option is available to those who have a regular source of income and have unsecured debts under $400,000. With a Chapter 13 bankruptcy, there isn’t any collateral attached. Credit and medical debt are both considered unsecured debt. With this option, applicants can keep all of their assets and reach an agreement with the courts on repayment options. That means the house, the car, the kids—wait, scratch the last one, they certainly don’t want those (wink), but it means you are able to keep your stuff and work to repay your debts without further penalties. In some cases, the debt amounts are reduced. Which type of bankruptcy takes longer? In short, a Chapter 13 bankruptcy will take longer because you have made obligations to repay your debt. This option reduces the amount of debt owed and can take anywhere from three to five years, while a Chapter 7 generally only takes a few months, and happens once assets are liquidated and approved by court decision. How do these two types of bankruptcy compare to each other? If reading line for line gets too jumbled up, take a look at this easy to read comparison chart that gives insight into each option.